Welcome to the Black Horse Inn! "Located near Historic Old Town Warrenton on 21 acres, this historic and elegant hunt-country estate has 10 guestrooms (four with fireplaces and Jacuzzis) all with private baths and spectacular views of manicured gardens, stone terraces and thoroughbreds grazing in rolling pastureland. Guests are greeted with a "hunt-country tea" offering sherry, port and hors d'oeuvres. A full breakfast is included. A formal ballroom can accommodate up to 200 guests for stylish Virginia Hunt Country weddings, corporate retreats, galas and receptions. 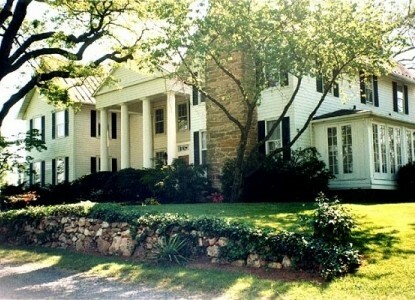 Voted "Best Inn in the Nation" by Arringtons B&B Journal. Antiquing, vineyards, riding, hiking, golf. Stabling available for horses." The award winning Black Horse Inn in Warrenton, Virginia has ten very special and elegant rooms available for travelers with the most discriminating of tastes. Rooms are furnished with both antiques and reproductions. Rates include double occupancy, a homemade breakfast and afternoon hunt country tea consisting of sherry, port, wines, and hors d'oeuvres. Tempting breakfasts are served in the main dining room, or on the sunny dining porch. 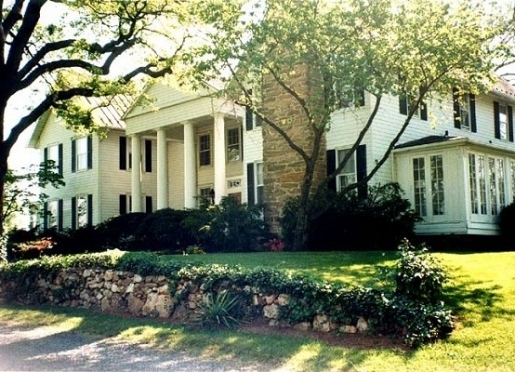 The Inn has ample porches, landscaped grounds, boxwood gardens and spectacular views. Many guests enjoy simply relaxing in the Inn's comfortable rooms and public areas, or strolling the grounds. Wildlife abounds, and white-tailed deer and red fox can be spotted in the fields. The lovely boxwood garden, with its' white gazebo, offers a serene setting for afternoon tea or a pre-dinner cocktail, or choose the library, or one of the Inn's comfortable porches. Guests can spend the day hiking nearby or in the Blue Ridge Mountains on the Appalachian Trail. 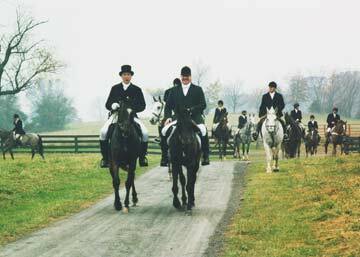 Or they can enjoy wine tasting at one of the seventeen nearby wineries in the surrounding area, antiquing, cycling, paddling, horseback riding, polo, fox-hunting or steeplechase racing. Weddings in the Inn's grand ballroom are a specialty. Imagine riding up in a horse drawn carriage, and delicately floating down the aisle to greet your soon-to-be partner for-life. The environment is perfect for romance. Step back in time at The Black Horse Inn, an enchanted setting for the most discriminating bride and groom. With its stately white columns, manicured lawns, beautifully appointed gardens and elegant hunt-country decor, this is an ideal location for a wedding. Perfect for bridal photography, the scenic landscape of the Black Horse Inn offers a grand wedding gazebo perfect for wedding ceremonies, nestled in a gracious boxwood garden under a canopy of century-old trees. The garden terrace features a picturesque pond with a white-picket bridge, overlooking a gentle waterfall. Brides and grooms consistently rate the Inn Best Wedding Arrangements in the National in a poll taken by Arringtons B&B Journal. The Black Horse Inn, Warrenton, Virginia is the ideal escape for business meetings, brainstorming sessions or revitalizing corporate retreats. The natural solitude of this historic, hunt-country estate encourages effective meetings and creative thought. Located just 45 minutes from Washington, D.C., you will find that our spectacular setting will lead to creative ideas and a clear mind to tackle even the most difficult tasks and problem-solving sessions. This bed and breakfast provides lodging and atmosphere for the most discriminating of corporate executives. The scene is straight out of an old screenplay. Imagine riding up in a horse-drawn carriage, gathering your petticoats, and delicately floating down the aisle to greet your soon-to-be partner-for-life. The environment is perfect for romance as you are surrounded by the evening starlit sky, incredible landscaping and all your loved ones wishing you well for a lifetime. With its stately white columns, manicured lawns, beautifully appointed gardens and elegant hunt-country decor, this ideal location is an enchanting setting for any bride and groom. Only 45 minutes from Washington, D.C. in Warrenton, Virginia, the Black Horse Inn offers not only excellent location, but also the charm and romance that make the most beautiful of wedding memories. 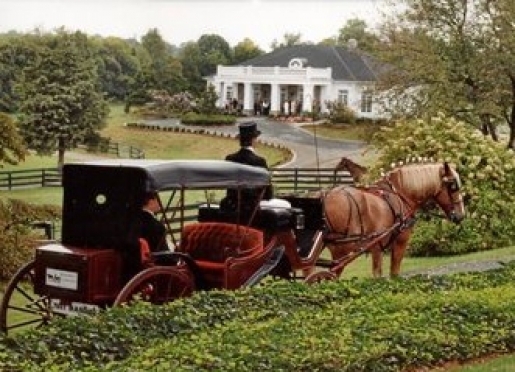 Situated on 21 rolling acres, horses traditionally greet each bride and groom on their wedding day. Our grand ballroom, The Gilded Fox features seating for up to 200 guests, breath-taking panoramic views of horses grazing in pastures, a stone fireplace and a stately flagstone terrace.The garden terrace features a picturesque pond with a white-picket bridge, overlooking a gentle waterfall. A fountain graces this photogenic location for elegant outdoor events. Perfect for bridal photography, both candid and posed, the scenic landscape of the Black Horse Inn offers a grand wedding gazebo and a magnificent portico. The gazebo completes the picturesque setting for wedding ceremonies, nestled in a gracious boxwood garden under a canopy of century-old trees. Gracious sitting porches surround the Black Horse Inn, and each have glass panels to accommodate guests during inclement weather. Ten guest rooms, each with a private bath, are available for family, friends or out-of-town guests. Additional accommodations are available nearby for larger wedding parties. The Black Horse Inn takes pride in giving brides an elegant, tasteful atmosphere in which to hold a reception, lasting the whole weekend, rather than just a few hours. The Black Horse Inn is located at 8393 Meetze Road, Warrenton, VA 20187 and lies about 45 miles southwest of Washington D.C. at the intersection of Rts. 29 and 643.